Looking for the finest in health and beauty products? Whether you want to lather things up a storm in the shower or indulge yourself with the finest makeup and skincare products, you’ll find everything you could ever need at garden.co.uk. As a premium stockist of some of the world’s top brands, they’re experts in helping you look and feel your best. Garden Pharmacy was founded in London’s Covent Garden in 1984, with the aim of bringing the finest beauty products from the world’s favourite brands to discerning customers within the UK. They’ve got just about everything you need, whether it’s creams and lotions to buff up your skin or beautiful fragrances to make you feel special every day. And don’t forget that you can make big savings with a Garden Pharmacy discount code. 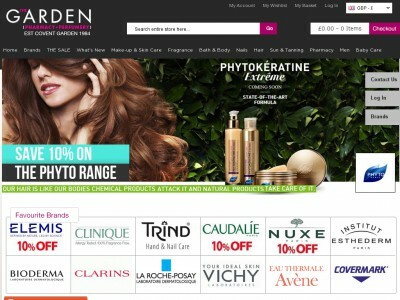 At garden.co.uk you’ll find a wide selection of products including makeup, skin care, fragrances, bath and body products, nail care, hair care, pharmacy items and much more – all available to be delivered to your door for a bargain price! Navigate to garden.co.uk to begin shopping. Click ‘I have a voucher code’. Enter your Garden Pharmacy coupon in the box provided and click ‘Apply’. Standard UK delivery costs £3.95, or free on orders over £50. If you want to return your products for any reason to Garden Pharmacy, all you need to do is return your items in their original condition within 14 days of receipt. If you have any problems, queries or would like to know something more about the shop, go to this website: https://www.garden.co.uk/contacts. Buy now online at www.garden.co.uk. I love to treat myself to some lovely, indulgent beauty products, but I often struggle to afford them. Then I discovered what I could save with a Garden Pharmacy discount code. Now I can get great deals on amazing products from all the top brands, and look and feel my best all of the time!